Anything with a bread dough and filling is delicious right? The other night the boys wanted pizza pops but I thought we would do something a little different. Mini calzones are so easy and great for little hands to hold for lunch. My boys take them in their lunchbox for lunch and eat cold. Simply roll out 20 small rounds of pizza dough of choice. Roll thinly. I use the below recipe of mine. This is plenty for 20 mini calzones. You can halve the recipe but I make a full batch and freeze half. You can halve this recipe for two smaller sized bases or up to six very thin bases. Add the ingredients in this order: water, oil, yeast, flour, salt. Blitz on speed 7 for 10 seconds to roughly combine. Remove dough and place into a lightly oiled bowl. Cover with cling film and place into a warm spot. I use the front seat of my car or a warmed oven. Leave this to rise for approximately an hour or until doubled. Remove dough from bowl, knock out the air by shaping your dough into pizza bases. Allow to rise for another 30 minutes, ensuring it is covered with some cling film or bread mat or top immediately and bake. Bake for approximately 20 minutes or until cooked to your liking. For 20 mini calzones you will need 250g cheese and 1/2 cup of roasted capsicum and tomato paste, or to taste. Use as much or as little other ingredients you like. Ours are generally filled with cheese, ham, pineapple, capsicum and onion. Nacho mince works well in these as does veggie packed spaghetti sauce. Or try shredded garlic beef or chicken. Place some roasted capsicum and tomato paste onto the rolled out circle of dough. Top with a little filling of choice on one half of the dough. Pull the empty side of the dough over the filling to form a half circle shape and press the ends together. Ensure they are secure so the filling doesn’t come out. Place on a baking tray. Brush with milk or egg. Bake at 180 degrees for about 20-30 minutes. These can be frozen. I keep them in the freezer and then pop one into the lunchbox in the morning. It thaws by lunch time. They are delicious served warm or cold. 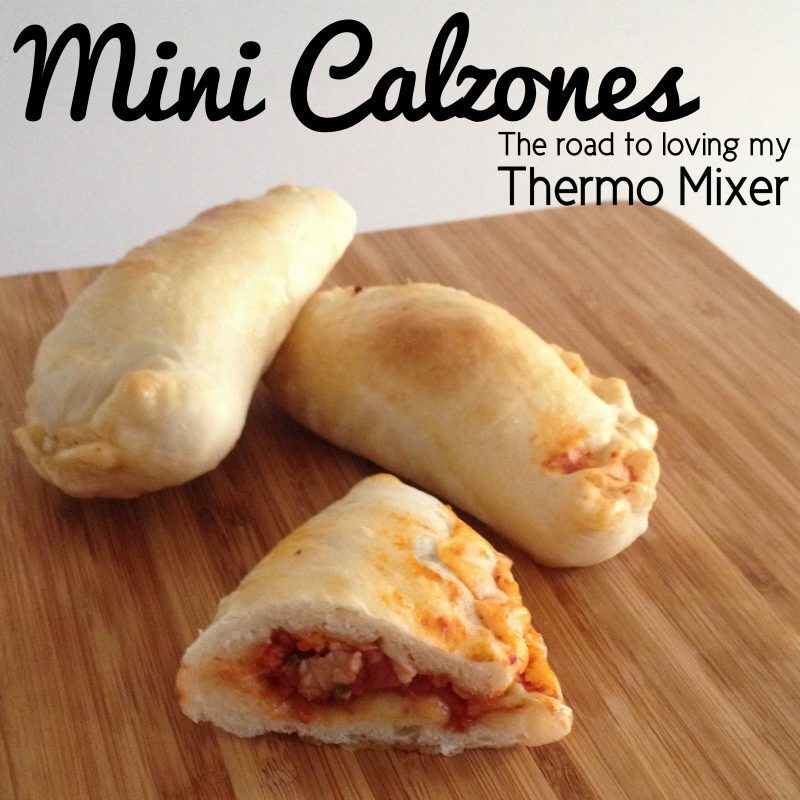 Making my Mini Calzones without a thermo mixer is easy! Simply use your hands to combine the dough ingredients and form a smooth dough. You will knead it for about 5- 8 minutes. It’s a great workout for those arms! Allow the dough to rise and continue with remaining steps. SO Yummy!! will definately be making these again!! !